Gun return with a five track EP, Popkiller – read the review here! Guns don't kill pop... well this one does. Having just saw them live in Glasgow – review HERE – just had to weigh in with my opinions on the “comeback” mini album Popkiller. Let Your Hair Down was first aired earlier this year on the mini tour, and I was fortunate enough to hear it during the Edinburgh gig. Loved it at the time, and it’s not overstayed it’s welcome. An ideal pick for a first single release – poppy, quirky, hooky with a chorus more infectious than swine flu, this is a great introduction to the ‘New’ Gun. Second track Seraphina was also aired at the Glasgow gig, and was a wise choice for me. Huge riffs set this out as perhaps closest to the older Gun material, but that’s by no means a bad thing. The keyboards add an extra layer of depth to the track, and it swirls and climbs into your brain and won’t get out. This was my favourite live track, but on record, it’s a totally different beast – again, by no means a bad thing. Reminiscent slightly of modern rock bands like The Killers? Popkiller is not only the title track of the EP, but for me is the out and out highlight. I will stick my neck out and say that I don’t think I have heard a song as good as this from anyone all year. The intro is very Roxy Music, but the riff that kicks in after dismisses any such comparisons, and is solid gold. The chorus on this is a thing a beauty, the backing vocals complimenting Toby’s voice. Call me a geek, but I already have the “pop… pop… popkiller” refrain as my text alert on my phone. Ripping Up The Letters has the uneviable task of following that monster, and does it manfully. The vocal delivery on this is perhaps the closest to Toby’s Little Angels days, but that matters not a jot – this is a finely crafted tale of love gone wrong with a memorable chorus that rattles round your conscience like an old friend turning up on your doorstep out of the blue. The Only concludes this five track demonstration of what road Gun are travelling on; Gun could be forgiven for easing up and taking a short cut, but this is anything but. A driving guitar hook and strong drumming power this track forward. The vocals and music again dovetail beautifully, and this is another quality piece of songwriting that bodes well for the future of the band. Snappier, poppier, punkier and dare I say it, younger sounding than anything else on the EP, it’s a fitting way to close out the record. If this five track offering is anything to go by, then the future looks bright for Gun. As a live band, they already cut the mustard – but with these tracks, Gun have shown they have more to offer and more yet to come in an already glittering career. 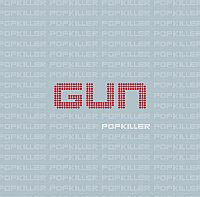 Author TonyPosted on Tuesday, December 8th, 2009 Categories MusicTags EP, gun, Music, Popkiller, Return, RockLeave a comment on Gun kill Pop!